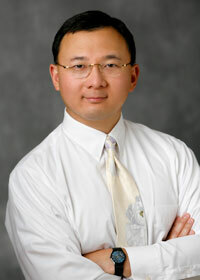 Yelp has become the bellwether for a location-based service, as well as the huge opportunity in local-mobile marketing. It’s also often mentioned in connection with social-local-mobile strategies, sometimes known as SoLoMo. Consumers also use the Yelp app as an integral step in the local purchase cycle. 93% of U.S. Yelp users in a recent Nielsen study said they at least occasionally make a purchase from a local business after using Yelp. Subscribers also gain access to over 100 in-depth reports and hundreds of charts and datasets on mobile, social, and their impact across industries, including retail. Local-mobile strategies are certainly working for Yelp, and the businesses that advertise on Yelp’s app and mobile site. Local advertisements on mobile devices constituted 40% of Yelp’s overall local ad inventory in the last quarter for which data’s available. That’s up from 25% just two quarters ago. 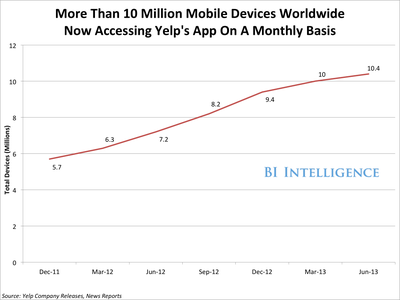 In the same period, Yelp’s mobile user base climbed to 10.4 million. Yelp is now in fierce competition with Google’s local services, as well as FourSquare, which is trying to become a local recommendations engine. 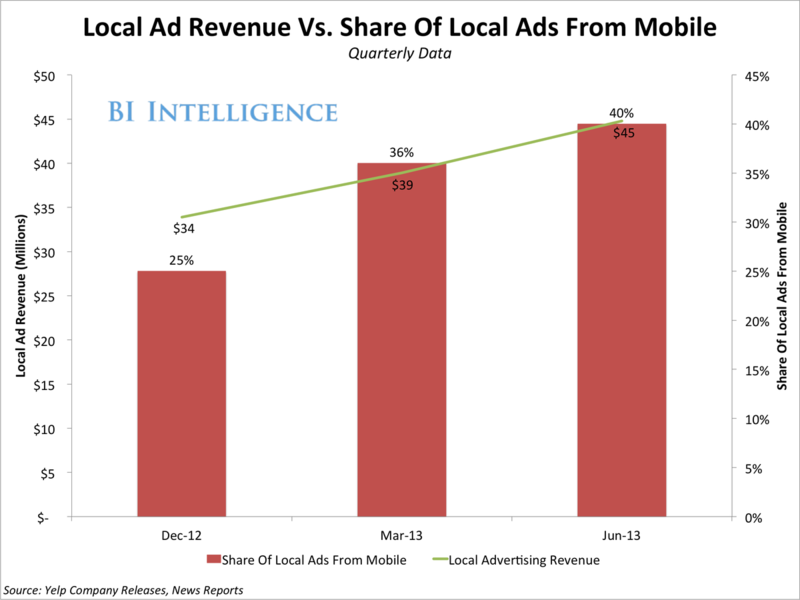 Here’s a look at growth in Yelp’s local advertising share, charted against the growth in revenue from local advertising. Yelp’s mobile app users are engaged through local discovery and the ability to make on-the-! go reser vations and appointments. Some might even write reviews on their handheld devices. Yelp can harvest all that relevant user information while also pinpointing a user’s whereabouts. As is the case with Google, the influx of mobile app users — and the increase in local ad inventory on mobile — have inflated Yelp’s overall local ad revenue. Pandora reported total mobile revenue growth of 92% year-over-year, according to the company’s earnings released last week. That puts Pandora’s mobile revenue at $116 million, almost 72% of total revenue, up significantly from a 65% share last quarter. More than ever, Pandora is a mobile-first company, and its efforts to build a media business around mobile advertising make it a bellwether for the industry. 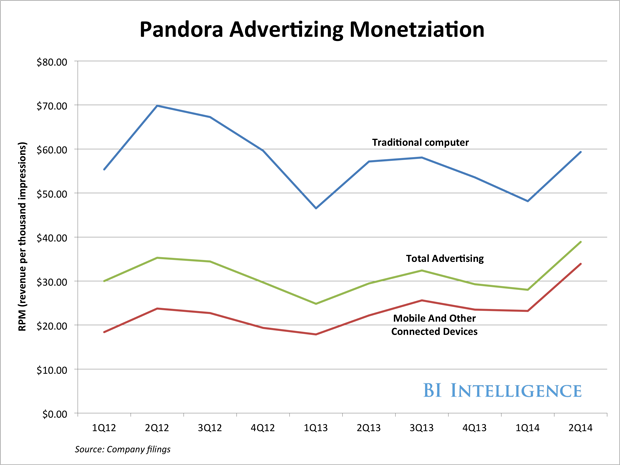 In the recent past, Pandora seemed to be struggling to monetize mobile effectively. 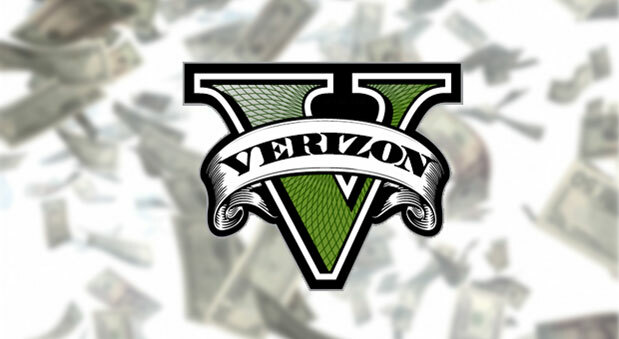 The company even saw its RPM rate, the amount of revenue it could command for a thousand advertisements, decline in recent quarters. 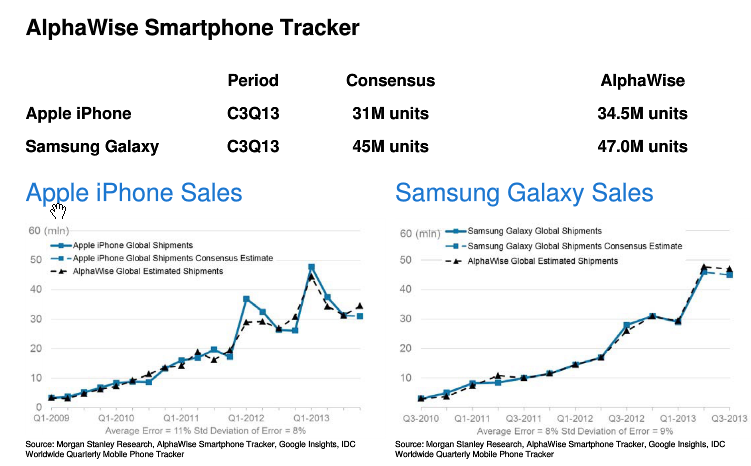 But this past quarter it accomplished a 180-degree performance turnaround. Pandora’s RPM rate jumped 52% compared to the same quarter last year, and 39% compared to the prior quarter. Pandora executives have attributed the impressive mobile numbers to app improvements and bulked-up efforts to sell locally targeted ads. Pandora has improved its ad revenue picture enough that it now feels confident lifting its 40-hour-per-month listening cap for free mobile users, despite the increased content licensing costs that will bring. The end of the 40-hour cap could also be seen as a preemptive defensive tactic against the expected September launch of Apple’s iTunes radio streaming service. Apple’s iPad business, which is supposed to be its second mega-business, has already hit the wall as far as growth is concerned. Last quarter, Apple reported sales of 14.6 million units, a 14% drop on a year-over-year basis. On the company’s earnings call, Apple’s execs said that if you look at the actual sell through of the iPad, and factor in channel inventory changes, then it was down 3%. 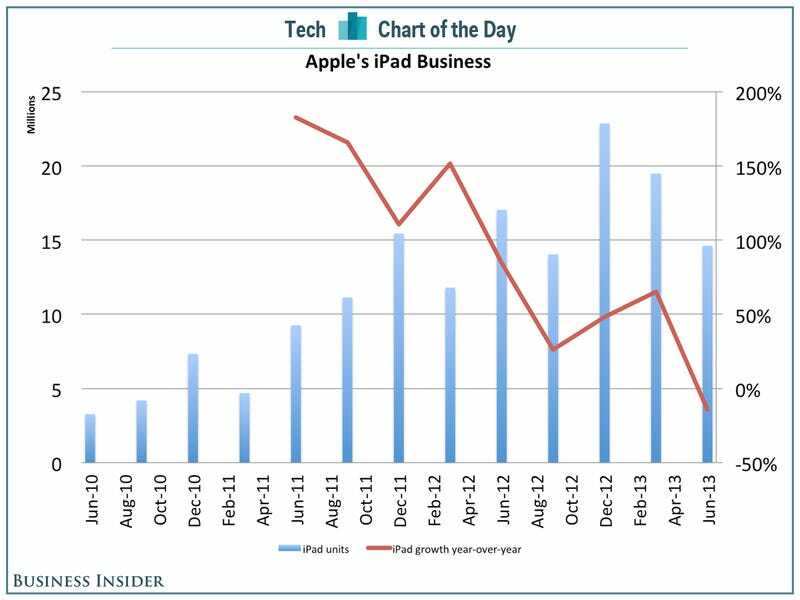 Part of the reason the iPad business fell is that Apple didn’t roll out a new version of the iPad last quarter. 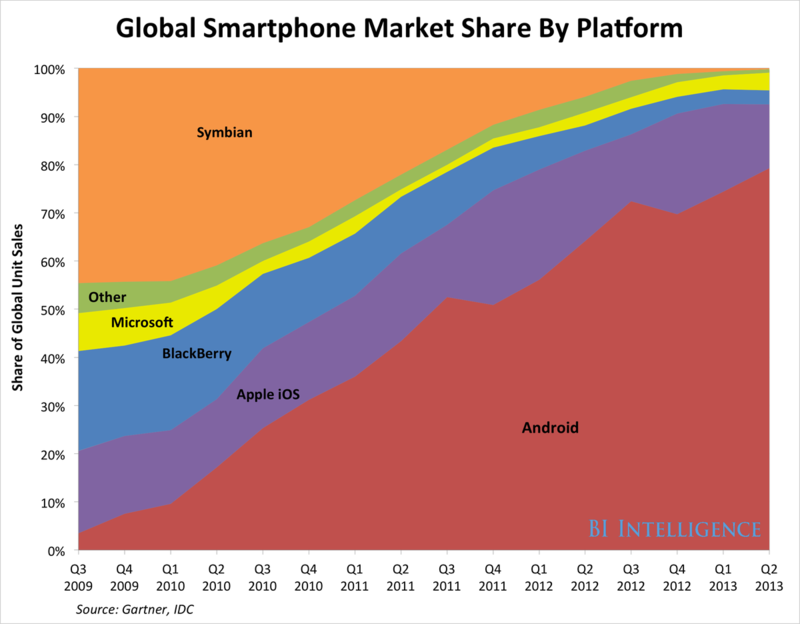 In the June 2012 quarter, it was introduced the high-resolution iPad which boosted sales. 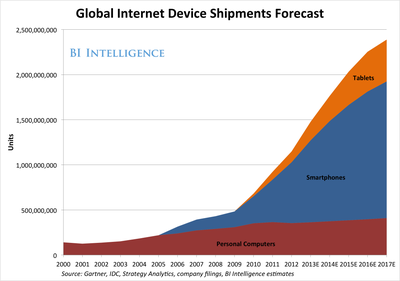 With no new model of the iPad, sales lagged in comparison. However, last year Apple wasn’t selling the iPad Mini. The $329 iPad Mini should have provided enough of a lift to offset the lack of a new iPad model. This isn’t just a one-off bad quarter. 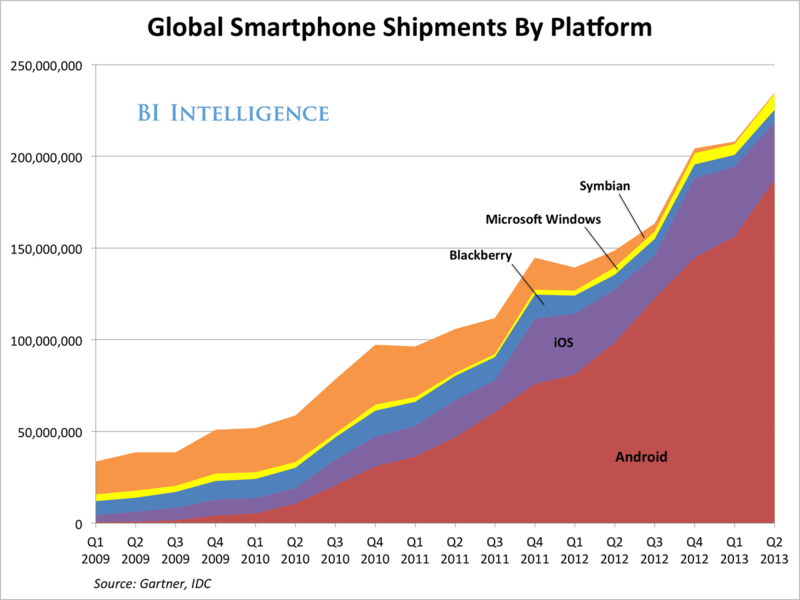 If you look at the trend, you can see that growth is in a general nose dive for the iPad. Analyst Gene Munster says the reason the iPad business is weaker than expected is that the market is “becoming more price sensitive than we previously expected.” In other words, consumers are buying cheaper tablets from Apple’s rivals.